You are here: Home » MEDIA » TV » Clarkson’s Amazon Top Gear ‘upgrade’ TV show named ‘The Grand Tour’. Clarkson’s Amazon Top Gear ‘upgrade’ TV show named ‘The Grand Tour’. 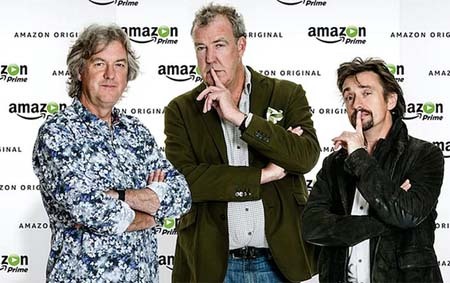 Amazon announced in 2015 that Jeremy Clarkson, Richard Hammond and James May would reunite to make a new car show available for Amazon Prime members, shortly after they left Top Gear after late-dinner-punch-up-gate. The show is produced by the trio’s long-time executive producer Andy Wilman. The team have committed to three series as part of this TV deal. The first series went into production in late 2015, and the series will premier for Prime members fall 2016. So, Clarkson, Hammond & May are to call their new Amazon Prime Show The Grand Tour. Why? The Grand Tour will launch this fall for Amazon Prime members and the new travelling format means Amazon customers around the world will have the chance to be in the audience when tickets are released through a sweepstakes this summer. Details of the location schedule and information on how to apply for tickets will be announced shortly. « Uncanny Magazine #10 May/June 2016 (emag review).